I discovered Dorothy Parker in college via Carrie Fisher, who claimed her as an influence. I've read the Portable Dorothy Parker and Marion Meade's bio, both of which I recommend in a heartbeat. I liked Meister's The Other Life, too, so this seemed like a slam dunk. I liked this story, but I feel it falls short of lovelovelove. This is the story of a writer named Violet who deftly skewers with movie reviews but in real life is a marshmallow. 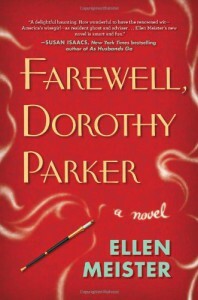 Through some comedic bungling at the Algonquin she comes into possession of a guestbook tied to Mrs. Parker's ghost, who becomes a confident and mentor. It sounds like an awesome fantasy, and as much as Violet admires Mrs. Parker she seems reluctant to follow the woman's forthright advice throughout the book. Without spoiling the entire story, I'll just say that Mrs. Parker seems to benefit another character more. I wanted to flip over this, and while I liked it I get the feeling Meister held back in her development of Mrs. Parker. Then again, she's always struck me as a very difficult type to pin down. Meister mentions in the acknowledgements that the plethora of Jane Austen-character books inspired her to write a Mrs. Parker novel because there are few, if any. I wonder if the reason it hadn't been done until was because nobody felt certain how to get the character done correctly.